The Santiva Salwater Fishing Team offers private, guided fishing trips for all anglers. 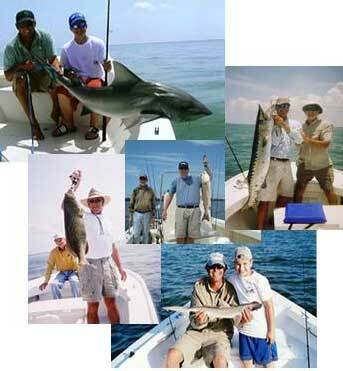 Our native Florida guides have the experience and knowledge necessary for a fantastic fishing trip. Below is a brief description of each of our trips; including prices (prices listed are for parties fo 4 persons or less). However, if your don't see the trip you had in mind; give us a call and we'll try to accommodate your desires. Trip prices include bait, tackle and fishing license. Customers need to bring food and drink for themselves. Captains will provide a cooler with ice. Customers also need to bring along a good mood, if a good mood is forgotten or a bad mood is brought by mistake, you will be left on the dock! 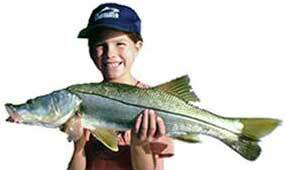 Our 2-hour "fun fishing" trip is ideal for small children. This trip is also good for anyone who wants a taste of saltwater fishing, or who may want to improve on basic fishing skills such as: the correct way to bait a hook, casting and tying knots. The 2-hour trip runs from 4pm-6pm. This short trip is for fun, and is "catch and release" only. The half-day trip is our most popular. Half day trips are 4-hours, from start to finish. We have morning (8am) and afternoon (12pm) departure times. (No, morning is not always better than the afternoon. Yes, saltwater fishing is different than fresh water fishing. Yes, the afternoons are hotter than the mornings. Yes, fish eat even when it's hot; it's always hot in Florida). Depending on the time of year, these trips target Tarpon, Shark, Redfish, Snook, Sea Trout and many more. (No, you will not fish for all species in the same trip. Yes, you may fish for more than one species during your trip.) These trips work well for novice and avid anglers alike. Filled to the Gills: $900. A whole day of backwater fishing for the hard-core angler. This trip is 8-hours, from start to finish. Full day trips target the same species as the half-day trips. This is the only trip that comes with a "catch-a-fish" guarantee. If you do not catch a fish on this trip; your guide will eat live bait in front of you (Offer valid only after full payment has been received. Offer void if the Captain has already emptied the live wells on the trip back to the dock. Captains are required to empty live wells on the trip back to the dock.) This trip is not recommended for children under 15-years old. A little fishing, a little shelling and a lot of fun for everyone! This is a combination trip. On this trip the choice is yours. You can fish, shell, snorkel, sightsee or stop for lunch at a one of the barrier island restaurants. You can also bring your own lunch and picnic on a secluded beach. This is a 4-hour trip with morning and afternoon departures available. All ages can handle a trip like this. Add'l hours can be added to any trip. Prices will vary depending on the size of your party. Please call for prices. Prices are per passenger. The maximum allowed on one boat is 6 passengers. Think you have seen Sanibel and Captiva Island before? Well, if you haven't been on the waters, you have missed the best part! Whether you are a new comer or a return visitor the waters of Sanibel and Captiva Island offer a new adventure everyday. It might be the great fishing for our many species that the waters offer, watching the Dolphin playing while they circle your boat hoping for a disgarded catch they can eat for lunch, the slow moving manatee swimming by, a funny sight on a barrier island beach or watching the hundreds of wading birds along the shore line. Fishing offers something even when the action is not what we all had hoped for that day. The waters are where it happens, and no two days are alike when fishing the calm waters of Pine Island Sound. Sometimes you will quietly creep along the mongrove bushes or anchor off an oyster bar hoping to hook yourself a copper colored Red fish with "eyes " on his tail. The guide might decide that your day is the day to float a pass of water for the powerful and wondress "bite" of the elusive Snook. 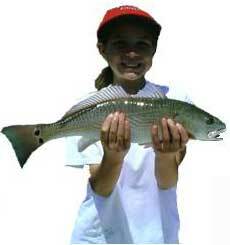 Perhaps your family might prefer the possible none stop action of trolling thru schools of Spanish Mackrel, or letting the gental coastal winds push the boat across the grass flats while fishing for the Spotted Sea Trout. How about fishing for something that's mighty? Mighty big that is! Late Spring and early summer offer the migration of the "Silver King", better known as Tarpon. I've never met a school age child that didn't want to return to school with the the tale of his or hers own "JAWS" adventure; catching sharks is a favorite of anglers of all ages. All of this is possible for you and your family while on vaction in the Sanibel Captiva area aboard the boat with one of the three Native guides of the SANTIVA SALTWATER FISHING TEAM. Every key or sandbar has it's own name for the guides "Redlight bar", "Steve's bar", "Accident hole" just to name three, but these guy's have a languge all their own and each name has a story behind it. They're up before the sun catching bait and preparing for the day of fishing. Even though your boat has only one guide aboard, you have the benifit of all three. A father, son and son-in-law eager to help each other out. They're in contact by phone sharing what is happening in their area of the bay. So you have all three guides working to make your trip a great experience. All trips are for all people...young and old...experienced or unexperienced...do as much or as little for yourself as you want. All bait, tackle and licences are provided. United States Coast Guard approved. Cooler with ice provided aboard for your use for drinks and snacks.